Blast from the Past. Going to start off each day with a random repost from the archives… Enjoy! Stocks opened moderately steady in price, but traders whose margins were exhausted began selling heavily… at one o’clock the stock ticker was recording prices from half past eleven… stocks dropped 11% intra-day… After a bankers’ consortium sent NYSE Vice President Richard Whitney to the stock exchange floor to offer to purchase in the neighborhood of twenty or thirty million dollars’ worth of stock at the previous selling price [most likely above their quotations], the market eventually closed with only a 2% loss. Not long after, the stock market plummeted in two days of panic: October 28 became known as “Black Monday” (13.47% decline in the Dow), and October 29 as “Black Tuesday” (11.73% decline in the Dow). 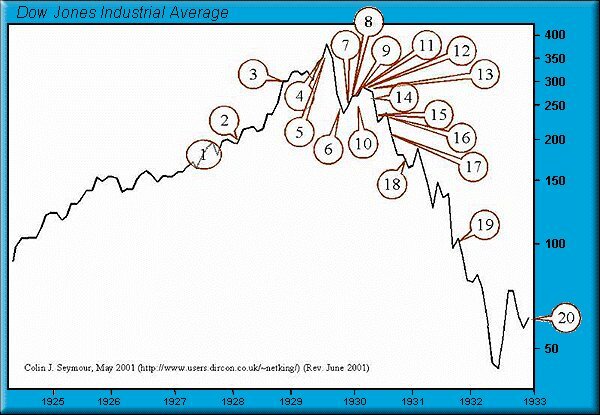 Between October 23rd and November 13th, 1929, the Dow fell by 39%. 1. Such amount of gold as may be required for legitimate and customary use in industry, profession or art within a reasonable time, including gold prior to refining and stocks of gold in reasonable amounts for the usual trade requirements of owners mining and refining such gold. 2. Gold coin and gold certificates in an amount not exceeding in the aggregate $100.00 belonging to any one person; and gold coins having recognized special value to collectors of rare and unusual coins. 3. Gold coin and bullion earmarked or held in trust for a recognized foreign government or foreign central bank or the Bank for International Settlements.